UTGARD - THE ONE AND ONLY GIANT "UTGARD" - Beyond the world of mankind and Gods, home of Giants and Trolls. DOMINATED by LOKI, the God of Giants. 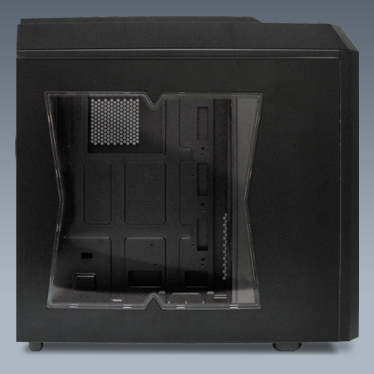 This chassis is supplied with 2 x 120mm pre installed fans on the front and the rear, one top fan with the size of 170 mm, but another 6 fans can be mounted in different areas for best possible airflow. 9 x 5.25" bays will be able to house all your optical drives, an external 3,5" device adapter and a 3 to 4 HDD Device. All mesh design on front panel. Four 3.5" HDD in three 5.25" bay adapter. Preinstalled 170mm top orange fan with white LED. Preinstalled 120mm front and rear orange fans with white LED. Two RPM speed control knobs for six fans. Back holes and clips for cable management. Drive Bay 5.25" External x 9 with tool-free holders. Six fan speeds are adjustable synchronously by two knobs on top panel. Audio in/out x 1 (HD Audio), two knobs of fan controller.